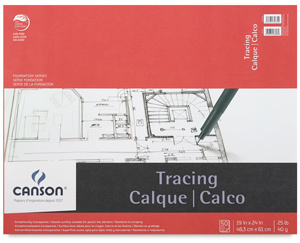 This economical tracing paper has an exceptionally transparent, smooth surface that is resistant to scraping. It is suitable for use with pencil, ink, and marker. 25 lb (40 gsm). This economical pad contains 50 sheets of tracing paper with an exceptionally transparent, smooth surface that is resistant to scraping. It is suitable for use with pencil, ink, and marker. 25 lb (40 gsm). Tracing Pad, 50 Sheets, 19" × 24"